While the sorrowful cry of bagpipes concluded the service for former Honolulu Police Chief Michael Nakamura, faces lit up as friends and family remembered a man renowned for his kindness, compassion and warm smile. About 2,000 people paid their respects at the Mililani Mortuary, Mauka Chapel, last night. Handi-Van drivers Rocky and Val Jeremiah stood in line to pay their respects. "He came to our wedding. That's how nice of a guy he was," Rocky Jeremiah said. Former city Prosecutor Keith Kaneshiro, a Farrington High School classmate, recalled how proud he was to have the Police Department and the Prosecutor's Office headed by two Farrington grads when Nakamura became chief in 1990, shortly after Kaneshiro took office in 1989. "He was a very compassionate chief," he said. "A real people person." Nakamura served as Honolulu police chief from 1990 to 1997, and was a member of the state Board of Education and a 2002 candidate for City Council. Nakamura suffered from spinal muscular atrophy, a debilitating disease similar to Lou Gehrig's disease. The muscles in his back, hips and shoulders were weakened and eventually left him unable to walk. 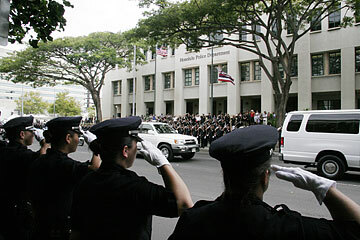 Police officers lined both sides of Beretania Street fronting the main station in honor of a motorcade carrying the ashes of former Police Chief Michael Nakamura. In the mid-1990s, he began occasionally stumbling, but he didn't slow down, becoming a familiar sight in his wheelchair or motorized scooter as he continued as chief, until 1997. Ryan Funayama, who sat in a wheelchair, knew Nakamura as a fellow Handi-Van rider and shared a cabin with him this past year at the Muscular Dystrophy Association's summer camp. "He was obviously very good, a conscientious man," he said. "Just by his example, you can learn a lot -- by the way he carries himself. The way he did things leaves a lasting impression." Former police officer James Yuen called the chief "very personable" and said "he knew you on a first-name basis." He recalls getting a call on his birthday and wondering, "Why the main chief calling me?" Yuen said it made him feel humble. A police dispatcher for the last 29 years, June Davis said she even got a call while on vacation. Davis said Nakamura was "amiable, very personable, well respected, well liked." He became lieutenant of dispatch upon his promotion from sergeant, she said. His Farrington High classmates recalled a similar young man. "He was always smiling, good-natured," said Sharon Yanagawa. She and about 30 other classmates passed out red roses because "he used to pass out roses to the workers so people would stop and smell the roses." Jadine Garcia said, "I was his favorite cousin." "No, I was," said Shary Kiriu, another first cousin. "Everyone was his favorite cousin." Her brother Curt said, "When he came up for chief, I knew he was going to be the one." 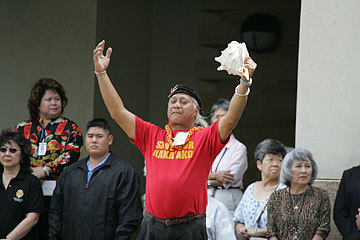 Manu Mook raised his arms in prayer yesterday as former Police Chief Michael Nakamura's motorcade passed. But when he went to Nakamura with a traffic ticket, he didn't receive any special treatment. "'Curt, you're responsible for what you did,'" Curt Kiriu said Nakamura told him. "There were no favors." After being appointed in 2000 to the Board of Education to fill a temporary vacancy, he was elected to a term on the board. On Sept. 29, 2004, Nakamura was struck by a driver while riding his electric wheelchair in a crosswalk on a Mililani street. He received severe injuries, including a broken leg, and suffered a stroke due to the surgery he had to undergo. But Nakamura publicly forgave the 21-year-old driver, who fled the scene, and didn't want him to go to prison. In his eulogy, the Rev. George Nagato recalled this as part of Nakamura's indomitable spirit. "He focused on the blessings rather than the cursings of life. ... He chose to smile instead of frown. ... He chose to look to people's strengths rather than weaknesses. ... He chose to forgive the driver who hit him." On his deathbed, he said, "I'm not afraid. I'm ready," pastor Norman Nakanishi said. He gave his life away by serving others, he said. He faced death with "tremendous courage" and even then, "his thoughts were of others." 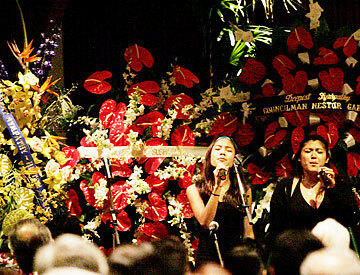 » Former Police Chief Michael Nakamura's nieces Summer and Niki performed Wednesday during memorial services for Nakamura. A photo caption in yesterday's morning edition incorrectly stated that the two were his daughters.